Experts say this poor stomach sleeper’s breasts will sag prematurely. Are you among the 16% of Americans that sleeps on your stomach? Most sleep experts will tell you to try acclimating to another sleep position. Sleeping on your stomach can cause your head, neck and back to be pushed upward at an uncomfortable angle. In addition, you’ll have to keep your head to one side or the other all night (breathing into your pillow is no fun, after all). The unnatural positions your head, neck and back are contorted into can cause aches and pains, particularly as we age. Sleeping on your stomach can even cause wrinkles and saggy breasts! While on your stomach, it’s very difficult to maintain a neutral sleeping position that allows your spine and neck to be aligned. Your spine is best off when it’s straight. It’s simple: bends and twists in your back can cause muscle strains and put pressure on nerves. Keep your back straight and you’ll avoid back pain. Unfortunately, stomach sleeping causes increased pressure on joints and muscles which can cause uneccessary soreness or numbness. First and most obviously, you should at least try to sleep in another position if you can. That’s easier said than done of course! We sleep the way we do because that’s what is comfortable. If you’re content on your stomach, then make the most it. What Can a Stomach Sleeper Do to Get Better Rest? A very simple technique that works for some: try sleeping with no pillow at all. This will achieve something close to a neutral sleeping position, helping to keep your spine parallel to the mattress. If that doesn’t feel right (and to most it will not), then you’ll want to find a low loft (thin) pillow that doesn’t elevate your head too high. Some pillow manufacturers have specially designed low loft stomach sleeper pillows. Most of these are quite simply thin pillows, but some others offer wild features like special arm tunnels. What’s the Best Stomach Sleeper Pillow? Most pillows are simply too thick for a stomach sleeper. Your best bet is always going to be a thinner, low loft pillow type. An adjustable pillow with a zippered opening that allows its fill to be added or removed will give you the ability to fine tune it to your preferences. No single pillow works for everyone. Squeezing a pillow inside plastic packaging at the store isn’t the way to find the right one. You need to test drive them in your own bed. Check the manufacturer’s return policy and make sure that you’re able to try it for at least a week. If it’s not right for you, toss it back in the box and return it. You spend a third of your life with your head resting on a pillow, so a little shopping and experimentation is absolutely worth it. We of course, recommend buckwheat pillows for stomach sleepers. Buckwheat, millet and kapok pillows are often sold with zippered openings, while down pillow cases are always sealed. 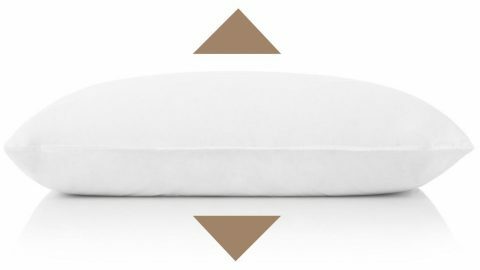 Being that a down pillow’s fill is not adjustable, be sure to shop specifically for low loft variations. If you’re content to stay on your stomach, first try sleeping with no pillow at all and if that doesn’t work out, do some deliberate and careful shopping for a new pillow. The best stomach sleeper pillow will provide you sufficient support for both your head and neck without elevating them too high. Above all, it’ll simply be comfortable. 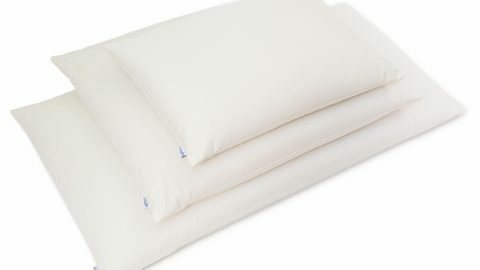 Buckwheat pillows are supportive, adjustable and stay cool all night long. I’ve tried other positions. I fall asleep on my back but wake up on my stomach every time. How would I possibly stop that from happening? As an infant it was common for me to belly sleep sometimes with my rear in the air and until the start it’s been the only position I could sleep in. I also sleep with my arms folded under my head. If it helps I’m 33 so I’ve been sleeping belly side down for around 3 decades. If you’re able to fall asleep on your side, you can try using a body pillow (or a king size pillow). Keep the pillow under your torso and it will create the sensation of being on your stomach. Have you looked at the photo and caption? You might want to rethink one or the other. Sort of takes away from your credibility.